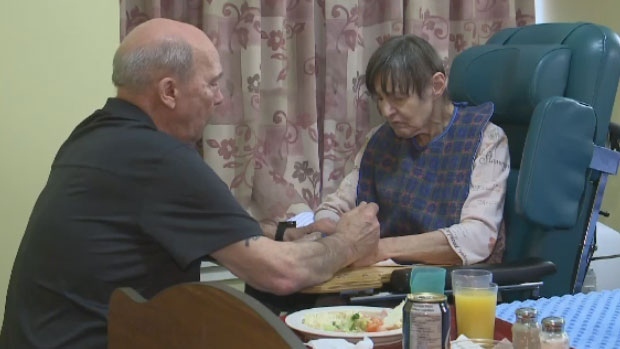 A family who has a loved one in a New Brunswick nursing home says they can sleep better knowing a court order is in place barring nursing home workers from striking until at least April 17. Ron Bruce visits with his wife Lynn at York Care Centre almost twice a day, every day. Lynn, 71, has Alzheimer’s. When Ron can’t visit, he trusts the staff at York to take care of her, but a looming strike had him worried enough to put together a contingency plan. “I would be here a lot earlier in the morning, 6:00 a.m., and probably here overnight during the strike, so yeah, we’re relieved,” says Ron Bruce. That relief comes from Thursday’s ruling that nursing home workers in the province won’t be able to strike until at least April 17, when an appeal will be heard on the labour case which has become political and legal football over the last two weeks. On Thursday, the People’s Alliance joined with the Green Party, demanding that binding arbitration should be ordered if the government and the union can’t come to an agreement. On Friday, New Brunswick’s Liberals joined that call, meaning a majority of the province’s legislature, 27 total members, are now calling for binding arbitration. But Premier Blaine Higgs says his government can’t afford that practice. The two sides are scheduled to return to the negotiating table on Monday afternoon. In the meantime, some families like Ron Bruce, are able to breathe just a little bit easier, but still have concerns and want to see nursing home workers better compensated. Bruce says he’s willing to do whatever it takes to make sure Lynn gets the care she needs, but he hopes it doesn’t come to that. Ron Bruce visits with his wife Lynn at York Care Centre, and was relieved to hear that nursing home workers in the province won't be striking until at least April 17.